After weeks of trying to predict the top players picked in the draft, it was no surprise, the Cleveland Browns took Texas A&M defensive end Myles Garrett with the #1 pick. But then things got a bit wacky. The Chicago Bears surprised everyone by trading up with the San Francisco 49ers to take North Carolina’s quarterback Mitchell Trubisky (who has only had 13 college starts) with pick #2. This pick was widely considered the worst pick ever in draft history. Then at #3, the 49ers grabbed Stanford’s defensive lineman Solomon Thomas (the highest a non-QB Stanford player has ever gone in the draft) and touted as a solid choice. The Niners also received praise for grabbing Alabama’s Reuben Foster with the 31st pick. A few other highlights, the Jacksonville Jaguars and the Carolina Panthers picked up LSU’s Leonard Fournette and Stanford’s Christian McCaffrey (highest drafted RB the Panthers have ever chosen) with the #4 and #8 picks. At #6, the New York Jets received widespread praise for picking LSU Safety Jamal Adams. For the rest of the first round picks, click here. 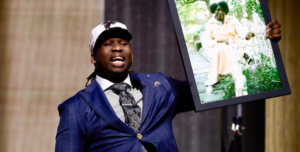 In one of the most heart-warming moments of the draft, UCLA’s Takkarist McKinley, drafted #26 by the Atlanta Falcons, held up a photo of his Grandmother and became emotional as he explained his promise to her that he’d go to a division 1 school, get out of the neighborhood and make it to the NFL. McKinley cursed on live TV during his speech and will get fined by the NFL, but it’s heartwarming to hear and see his emotions.